In case you’ve not heard, one of my goals for 2015 is to write 52 short stories- one for every week of the year. Thus far I’m on schedule (hopefully I can say the same thing in July!) and at some point a few days ago, I wasn’t quite sure what to write. I had come up with a few ideas during the week, but I wanted flesh them out in my head a bit more before putting them to paper. Thus, I came up with the D10 Challenge. 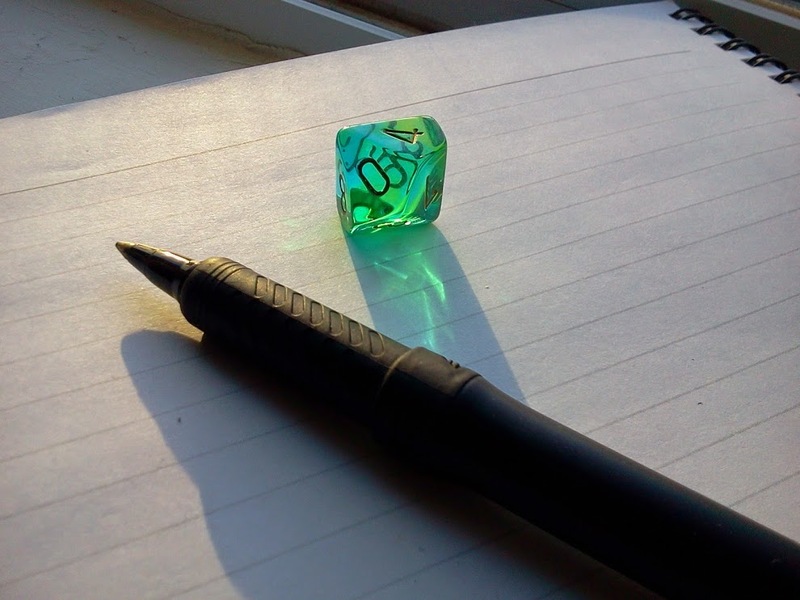 In case you’ve not heard of it, D10 dice are 10-sided and typically used for roleplaying games- the old fashioned kind that require a paper, pen, and imagination. In order to participate in the D10 Challenge (or the #D10Challenge to easily find it across various social networks), all you need is, no surprise, a D10, which you can get for cheap on Amazon or at your local comic book store, a book (the longer the better), and some way to write the whole lot down. Some folks may prefer paper and pen, others type, still other will wind up using an old-fashioned printing press. Whatever floats your boat! Once you have all your supplies assembled, roll the die three times, and write these numbers down. Let’s say you wind up with “174”, you’ll crack open your book to page 174. If your book only has 74 pages, just go to page 74; on the other hand, if your book is over 1,000 pages, roll four times. If your book is over 10,000 pages, remember to lift with your knees. Once you’ve opened your book to the page you need, roll the die eleven times and write down the numbers. The first number is the line number- the next ten are the word numbers. If you roll a zero during the first of your eleven rolls, you can pick the line you start with. Now, starting on your line, use the first number to determine which word you take- continue this process with the last nine numbers and boom, these are the ten words that will inspire your story. Also, any of your last ten numbers are zero, you can pick any word you want- moving forward, of course. How you go about writing the story is completely up to you- but you need to involve those ten words in some way or another. I’m not saying that they need to be included- but adding them does add a nice extra layer of challenge. When I took the D10 Challenge myself, I used my copy of The Unabridged Edgar Allan Poe and wound up in the second chapter of The Journal of Julius Rodman. For your reading pleasure, I’ve included the story below. If you take the #D10Challenge, be sure to let me know! Either tweet me @Jourdan_Cameron or leave a comment. “You mean in the next six months,” I chuckled. “They don’t call me Practical Pierre for nothing,” he said, pointing a thumb at himself. As we left the cabin, I decided to put my camera on one last time. I slipped the Omnopticam onto my head- it was the latest version- or, at least, what was the latest version when we departed into the woods- it looked and felt just like an ordinary black knit cap; I’m pretty sure there aren’t any other knit caps that require access to Multipurpose Atomic Batteries, unless there have been some real innovations in the last twelve months. “That is in spite of the fact that they’re fake. Very nice, Pierre.” I looked back at the cabin; it had begun to vanish behind the trees. I shook my head. “The village is just ahead, maybe it was-” Pierre suddenly tumbled down the slope. I rushed to meet him at the foot of the hill where he lay still on his back atop the fake fur, eyes wide. “Pierre, are you alright?” I crouched beside him; he didn’t answer. Instead, he stared just past me at the hill. A masked figure in dark clothing was walking down the hill, bearing a long rifle in both hands. Heart racing, I looked back down at Pierre, whose wide eyes would see nothing more. I took off running for the village- a bullet struck the trunk of a tree as I passed it, spraying bark and wood in a plume. I caught sight of the village and hoped that the trees had swallowed the sight of my back from the sniper’s view. A village woman grinned as she caught sight of me. We hurried past the quaint village buildings to the Sync Center- the only building in the whole resort with any connection to the outside world. Once a week, Pierre and I would come here to upload footage to the editors at the distribution company. We reached the tiny building at the other end of the village- the Sync Center is little more than a well-insulated shed with a large screen on one wall. “Hello,” spoke an irritatingly calm voice as I entered the Sync Center. “Would you like to access the Internet?” The screen on the wall glowed a pensive shade of blue. “User Kim, emergency police!” I shouted. “Thank you. Connecting… Connecting… Connecting… Connect-” the voice vanished, and the screen went dark. A cold knot formed in my stomach. “Stay here,” I said to the visibly shaken Mrs. Rodman. Jaw clenched, I slowly opened the Sync Center door- the village was quiet as always. I looked right, and looked left- no sign of anybody. “Congratulations, Kim.” The voice that was neither distinctly male nor female had returned to the shed, though the screen remained dark. “If you’re hearing this, it means that your most recent upload has been receieved and viewed over ten thousand times.” The screen flickered to life, and it had begun to play the footage of Pierre rolling down the hill- I’d completely forgotten that I left Omnopticam running. “You need to get out of here. They’ve sent the sniper for you,” Mrs. Rodman said gravely. I gritted my teeth. The sweet old lady I had come to trust was a traitor. I was ready to hurl her into the river- but I didn’t have the time to drag along a hostage. Just a quick heads-up, I’m giving away a copy of Elegy for a Dead World– in case you’ve not heard of it, it’s a video game for people who write- or would at least like to give it a shot. It’s inspired by the works of Keats, Shelley and Byron, and it’s worth checking out. ← What Shall I Write Next?